Back in 1933 founder and innovator Sol Koffler used his life savings to start a luggage company in Providence, Rhode Island. His dream was to build a tough suitcase which could sell for a dollar – and thus, American Tourister was born. Since its founding and the initial goal of providing affordable quality luggage for all travelers from all walks of life, this brand has branched out to provide both lightweight soft suitcase designs as well as hard shell designs. 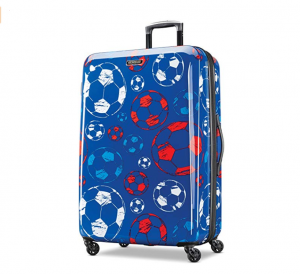 These more durable harder designs include American Tourister’s Moonlight collection which is a customer favorite for its affordable durability and large range of unique style options. In this review we’ll be taking a harder look at this Moonlight collection to determine and discuss its design, overall durability, among other important features. 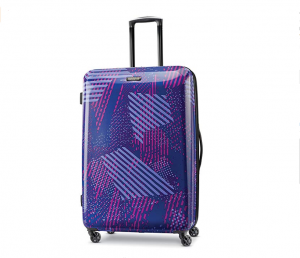 American Tourister spinner designs are clearly the favorite suitcase from their large catalogue, and this particular Moonlight collection is not just your average spinner design. 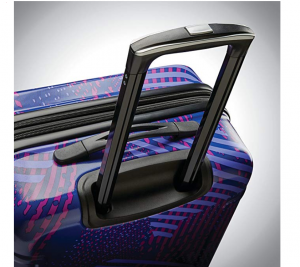 Sure, it has 360-degree spinner wheels, but its also equipped with a durable high-quality aircraft grade aluminum locking telescopic handle on top of a unique durable material not seen with other suitcases. The design includes 3 pieces which can be purchase together as a set or separately for your personal needs; the set offers a 21-inch carry-on suitcase, a 24-inch medium bag which can be checked and even sometimes used as a carry-on, along with a large checked bag at 28-inches. 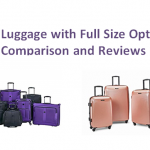 These bags are also expandable and therefore compete very well against similar hard shell designs like Lucas Luggage’s Avalon Spinner Carry-On. However, at their available unexpanded sizes, they still offer plenty of room without the fear of going over any weight restrictions, meaning no matter how pack the American Tourister Moonlight collection will have a lot of storage space to offer.  If you’re a traveler who purchases and operates best based on how much storage space a suitcase gives you, you’re not going to need to look much further than this American Tourister Luggage review. The suitcases in the moonlight collection are fully expandable up to an additional 2-inches (or 15% more packing space), however their unexpanded storage is still just as impressive. Not expanded, at 21-inches, the carry-on suitcase offers up to 32 liters of packing space (easily enough to fit clothing for more than a weeklong journey. The 24-inch suitcase features 60 liters of packing space unexpanded, and the large offers a minimum starting storage space of 85 liters. Other storage features include a highly functional interior for added organization and space conserving packing for any extras you might bring home from your travels. 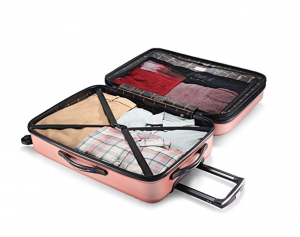 This interior offers a zippered mesh divider, tie-down straps, and a watertight lining which is flush with the suitcase and does not take up any extra space than it should. One thing lacking with this design is extra organizational pockets or clip-in toiletry kits; for instance, take a look at Delsey Luggage and its Paris Collection which offers a maximum of organization with a unique divided interior that includes pockets. 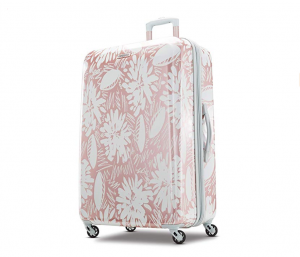 Suitcases in this American Tourister Spinner set feature first and foremost those 360-degree spinner wheels which have been rocking the world of travel more and more lately. Spinner wheels give travelers the option to transport their luggage quickly and easily even when crowds are thick or urban streets make wheeling a suitcase difficult; these bags can be rolled alongside you, behind you, or in front of you when airports are busiest and movement room is most limited. 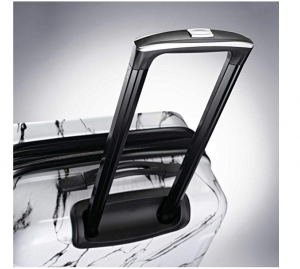 Of course, another feature which adds to this ease of travel is the locking telescopic push-button handle – made of aircraft grade aluminum – as well as the additional side and top haul handles which provide a safer way to remove your luggage from a carousel, lift your suitcases into an overhead bin, or move your luggage into a waiting taxi. The American Tourister moonlight collection includes a watertight interior lining, a zipper divided interior, and durable zippers throughout the design. Where weight matters some airlines will give you the option to use the 24-inch medium suitcase as a carry-on; however not all airlines are this way. For most carry-on purposes, especially for international flights, the 21-inch carry-on is the best choice; it weighs in at 7.5 pounds which is pretty close to the lightest unpacked weight you can expect for a hard shell that’s actually durable enough to protect all your belongings. Next in the weight category, however, are the medium 24-inch which weighs a total of 9.3 pounds unpacked (fairly heavy for a medium hard shell), and the 28-inch large checked bag at 11 pounds. Mainly you’ll need to be careful with your 28-inch large suitcase, because at 11 pounds unpacked weight it will be easiest to pack this suitcase and go over the 50-pound weight limit. Don’t worry, overweight bags are allowed to be checked onto flights, but this will result in an extra charge. For the best travel sizes and dimensions, we suggest packing your medium or large checked bags without using the zippered expansion, that way you have extra room on the trip back home in case you buy extra belongings on your travels. For quick business trips, we suggest going with the carry-on or medium suitcase; both bags are easily portable and offer a great maximum packing space. Durability is king when it comes down to the American Tourister Moonlight. The suitcases in this collection are made from a fantastic blend of ABS and PC materials, meaning they rank high on the durability scale while offering great scratch resistance as well as an overall weathertightness that softside suitcases can’t match. 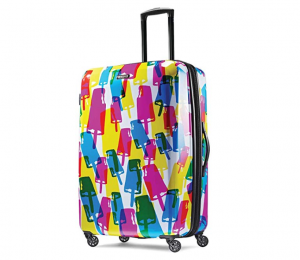 Other durability features include a reinforced two pole telescopic handle made from aircraft grade aluminum, spinner wheels which are screwed into the suitcase frame rather than riveted, and an interior lining which adds to the hardsides overall water tight design. One of our favorite features when it comes down to this American Tourister luggage review might just be the style choices. 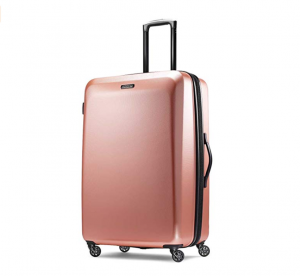 Other brand suitcases known for their hardside durability, like AmazonBasics Hardside Spinner Set, have fairly limited color assortments. 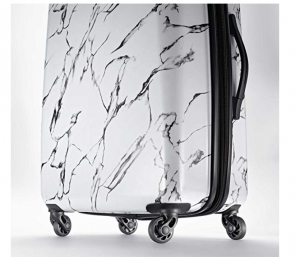 With the Moonlight collection you get a maximum of six different styles, and these aren’t just simple color variations; our favorite design is Marble, because this print very business friendly and offers a stylish solution which would look great beside any traveler and never get lost in an airport or overlooked on a luggage carousel. When purchased separately, it looks like the carry-on offers the widest range of style options. Business travelers can greatly benefit from owning the carry-on suitcase, it measures in at 20 x 14 x 9 inches (not expanded) and offers packing space which could easily fit clothing for a weeklong trip, even if your business trip is just a weekender away. The 24-inch suitcase measures in at 24 x 16 x 11 inches and you may have to check this for most flights, though there are certain airlines still taking carry-ons at this size. Finally, the large checked bag measures in at 29.25 x 19.5 x 12.5 inches, and although this is the easiest bag for going over the 50-pound weight limit, it’s also expandable and could easily fit enough clothing for a 3-4-week trip (with room to spare). Depending on your preference, each suitcase is great and will travel well on its own with great space for your journey length, or you can purchase these bags as a set, or even just as a set of 2 that includes the carry-on and medium or whatever variation will best suit your travel purposes. As well, all bags in this collection are nestable. 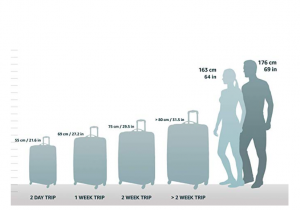 American Tourister offers a 10-year limited global warranty on all their luggage products. If a luggage problem is caused by manufacturing defects in material and workmanship, American Tourister will, in its discretion, either fix or replace the Product in accordance with the warranty terms and conditions, though as far as shipping goes there may be some expense to the customer. Damages they wont cover are any problems which are the result of neglect, misuse, or airline mishandling. Durable ABS and PC material blend. Maximum amount of storage space for a carry-on item with added 2-inch expansion. The medium and large suitcases are rather heavy when compared to certain other hardside brands. Spinner wheels aren’t nearly as durable as in-line skate wheels.